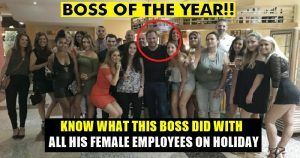 Boss Of The Year! This Man Takes His Whole Staff To A Luxurious And Free Holiday Tour For 3 Days! What do you do when you get a salary hike? You will be very happy and thankful to your boss, right! But, what will be your thoughts on mind when your BOSS takes all your colleagues and you for a luxurious trip on a Holiday? Sounds very strange right! Well, employee satisfaction holds equal importance as customer satisfaction and it seems that this businessman completely understands it. Meet the so called “BOSS of the year” Britain’s Ian Lucas who is the owner of a firm specializing in organizing stag and hen parties, as well as birthday trips and ‘girlie or lads weekends away’ based in Brighton. This businessman has proved that he has a big heart and leaves no stone unturned to reward the employees for their hard work. And the rewards are not casual ones but very expensive ones. Yes, the 48-year-old guy has proven himself the coolest boss ever by taking his whole staff to a luxurious and free 3-day long tour. He praised his team as ‘the beating heart’ of the firm and deserved to be rewarded for their hard work over the last 20 years. ‘Some of them have been with the company since it started, so it’s only right that these people are at the centre of our celebrations. ‘What sets Red7 apart from its competitors is a promise to create once-in-a-lifetime premium experiences. I wanted to bring that element of our ethos to life for my staff during this trip. As per the report in Metro, the lucky employees at British travel and party firm Red7 this month enjoyed luxury accommodation, Michelin-starred cuisine and VIP nightclub experiences as part of the lavish all-expenses paid Marbella trip. The company has arranged more than 300,000 stag and hen parties since Mr Lucas founded the firm in 1997. Mr. Lucas also treated his employees to a trip a decade ago to mark the 10th anniversary of Red7, flying them to Benidorm, and is already making plans for what he can do when the company celebrates its 30th birthday in 2027. We bet many of you would be thinking to leave your job right now and join this guy’s firm.